Here's the thing about the Oculus Rift: you can't move around while using it. Sure, you can lean, duck, and so on if you've got the Oculus Touch and the tracking cameras that come with it, but you're certainly not able to run around in an empty room that's filled in by virtual reality. When it comes to playing something on the Rift, even if your head and shoulders are moving, your feet are mostly staying put. That makes for a difficult situation with shooters. The Rift already has another Touch shooter game demo called Dead and Buried, which is basically an Old West-themed target shooting range. You stand in one place, blasting away at targets that appear in front of you, not unlike a carnival game. It's fun, but not the most compelling first-person shooter experience. 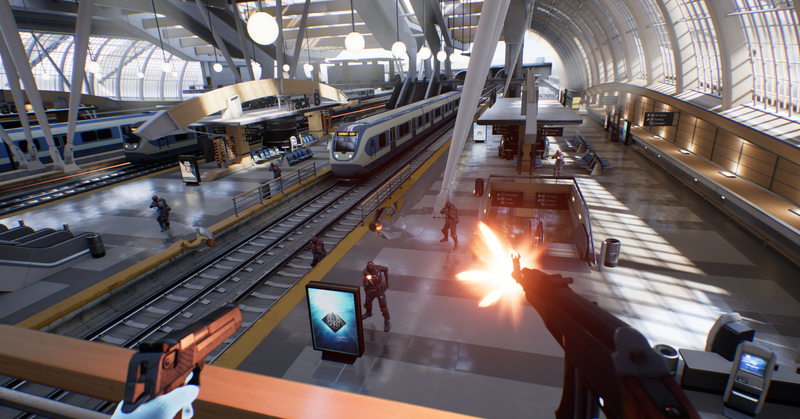 Epic's big addition to VR shooters in Bullet Train is an attempt to solve the moving-around problem. Because the head-mounted display in VR is attempting to make you feel like you're somewhere you're not, seeing motion can be disorienting and uncomfortable because your body knows you're not actually moving. Bullet Train skips traditional movement altogether with its teleporting ability. The teleport is tied to a face button and easy to execute: you look where you want to go, and a second later, you show up there. Teleport spots are fixed and permanent, and each has a gun beside it in Bullet Train, so you can plan your moves based on where the enemy is and what you want to bring into the fight. Teleporting around the arena isn't perfect, but it does suggest that, with refinement, it's possible to make fast-paced shooters in VR with one added benefit: They won't make you sick.